Nintendo Switch Dev Kit Stats Leaked? Cortex A57, 4GB RAM, 32GB Storage, Multi-Touch. 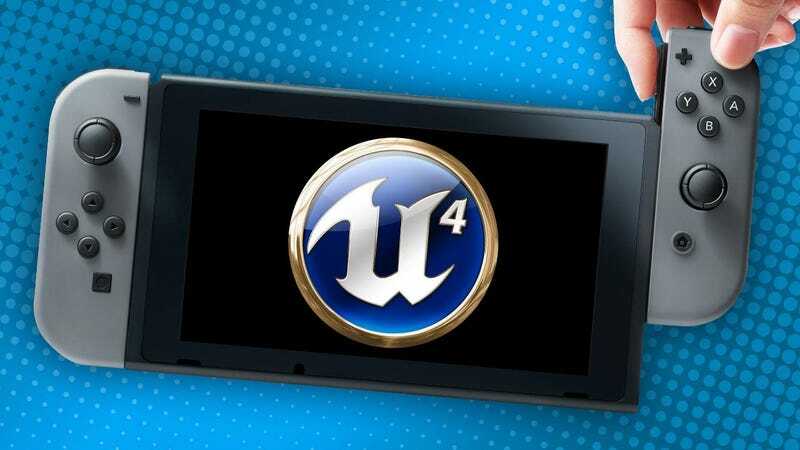 So what’s being said is that inside of Unreal Engine 4 there’s a section for the Switch which involves presets designed to get Unreal Engine 4 games running smoothly on the Switch first, tweaked later. However, according to a commenter on another website linked below. Websites are incorrectly reporting the information. The information found on the Switch presets uses numbers to represent the level of the settings. It was originally reported that “1" means low, “2" means medium, “3" means high, and “4" means ultra except for one case that goes by two’s. However, if the commenter is right, then those settings are incorrect. “0" is actually low, while “1" is medium and so on. So basically, if we go by this, it means that in console mode the Switch is running at high settings, while in portable mode it scales down to medium settings, while resolution(show in the post as ScreenPercentage) goes from 100% to 66%. Now, it’s been fairly obvious that the Switch downclocks when in portable mode to preserve battery life and not fry the system. The fan can only keep the heat down so much before it gets overpowered. Now, just for the sake of reporting what was actually said rather than taking a random commenters word for it, the original leak, or at least the way it was interpreted, suggested that console mode only ran at medium settings and portable mode at low settings. But the reason I’m more inclined to believe the random commenter more than the interpretations that news outlets are reporting, is not because I’m hopeful that the Switch is a beast, but because we have actually seen it running in portable mode on the Jimmy Fallon show. Reggie Fils-Aime pulled the Switch out of its dock while running Breath of the Wild and it looked like nothing had changed between console mode and portable mode, at least nothing noticeable, and the framerate, even in portable mode, appeared to be more stable than the Wii U version which is amazing. And keep in mind that viewers with sharp eyesight noticed the graphical differences between the Wii U and Switch versions. Now, obviously not every game is going to run better than a last gen console in portable mode. I imagine optimization has a lot to do with it as well. But that demonstration, coupled with the information presented here, and even mixed with the Dark Souls III Switch confirmation, suggests that even in portable mode the Switch has power possibly greater than the PlayStation Vita. Unreal Engine 4, supposedly according to this information, is running the full renderer, not the mobile version of it, and uses full FXAA in console mode. That’s great news because it isn’t gimped for the Switch despite its portable nature. It’s the real deal. At this point I think I’ve stopped caring about whether or not the chip is Maxwell or Pascal, if it’s last gen or current gen. This alone has restored a little bit of my hype for the Switch because it shows that Nintendo and NVIDIA are doing everything they can to get the most out of this device they’ve created, Epic Games is fully on board with the Switch and has dedicated support to it using the full engine, and third parties seem very impressed with what this little device is able to do. And while third party support has the chance to drop off again, the staggering amount of third parties that are willing to support the Switch shows that they see potential in the device. Whether or not sales can live up to expectations is of course up for debate, and if it doesn’t sell(Which honesty seems highly unlikely), then it isn’t a debate, it will lose all support, but Nintendo. One last thing to mention is that a lot of people are doubting the graphics of the indie title Seasons of Heaven, which is being developed on Unreal Engine 4. This information seems to suggest that a game looking like Seasons of Heaven is not out of the question for the Switch to handle.